What would Keynes say about the way his ideas are being used and abused to figure out what should policy makers do in the wake of recent financial crisis? I would like to believe he would not repeat his general theory. But leaving the speculation on this question for some other time, I would like to focus on Krugman and Layard’s manifesto for economic sense in today’s Financial Times. Interestingly, while arguing for differences in the European and US financial crisis, Krugman and Layard seem to have a single policy response as a panacea. This according to me actually seems to be a first step towards economic nonsense. 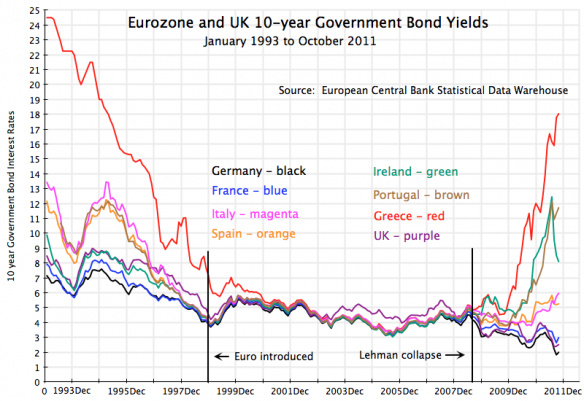 My reasoning is as follows: Among many other things related to how the ECB should function and whether Greece should stay or go, the European crisis is indeed a crisis of excessive public borrowing in countries like Greece, Ireland, Portugal, Italy and Spain. Contrary to this, K and L suggest that excessive public borrowing is a problem only in the case of Greece. To refresh on the EU situation, both of them might do good by reading or watching the work by Fernando Martin and Chris Waller of the St. Louis Fed. Fortunately, K and L get at least part of the US crisis right. They say it was caused by “excessive private borrowing” but leave out the counterpart that this appetite was whetted by the financial system’s need for collateral to settle debts between themselves. While K and L somewhat agree with these differences, their blanket prescription for government spending in both the cases makes little sense. Looking at the level of public debt that the above mentioned countries have, austerity does seem like the only way to go! On the other hand, considering the ‘paucity of good collateral argument’, at least in the long run US government should borrow and spend more. Now as K and L suggest, is there no evidence for deleterious effects of government deficits and the resulting borrowing on interest rates? The rising yield curves on government debt for countries in EU, (See this interesting chart on Andolfatto’s blog), seem to suggest otherwise. It is probably only US that can still borrow at a lower interest rate without risking an immediate rise in the future interest rate. This is primarily because the US dollar still remains a strong international currency and the ability of the US government to honor its debt is not yet in doubt. So as much one could argue for government spending in the US, especially on retraining programs or on Universities where the unemployed tend to flock, not all countries have the capacity to roll over their debt indefinitely and sustain such expenditure. So what should be the manifesto for economic sense? Thinking carefully about the nature of the two crises and suggesting policy prescriptions based on such analysis or lumping both these crises together and somehow arguing that government spending is a panacea in both the cases? I pick the former while practical men seem to gobbling down the later keeping with the Keynesian adage of falling for a defunct economist!